The compact 2018 BMW 2 Series is fast, nimble and affordable, yet can still be loaded with the automaker's best technology and performance features. In contrast to front-drive competitors like the Audi A3 and Mercedes-Benz CLA, the 2 Series routes power to its rear wheels, although both the 230i and M240i offer the option of all-wheel drive. If you're looking for 4 Series performance without 4 Series monthly payments, the 2 Series deserves a good long look. Pocket the savings or put it toward some desirable options. If you're looking for a coupe in this segment, the 2 Series is the only game in town. If you regularly carry rear-seat passengers, you'll be better off with a 4-door like the Audi A3 or Infiniti QX30. Those looking for a hybrid or diesel option will have to look elsewhere. A well-equipped Acura ILX costs less than a base model 2 Series. Changes to the 2018 BMW 2 Series are minimal this year. A new instrument panel, new color options and two new wheel designs mark the most notable changes, along with new LED headlights and taillights. The 2018 BMW 2 Series has seating for four, but its rear seats are best used for very small people or extra storage. Materials are high-quality, and the interior's fit and finish are impressive. BMW interiors are never overly ornate, and the interior of the new BMW 2 Series is simple and elegant. Seat comfort is exceptional as is the driving position. The gauges are clear and concise. Above the center dash sits a high-res color screen that displays navigation, audio and other info. It's controlled by BMW's now familiar iDrive rotary dial below the gearshift. Although we wouldn't call it the prettiest BMW, we like the muscular proportions of BMW's 2018 2 Series. This is a very attractive little 2-door, with an aggressive stance, dramatically swept headlights, BMW's now-signature L-shaped taillights, and a beautifully tapered roofline. Befitting the "M" designation, the M240i dials up the visual muscularity to back up its additional performance. It boasts a deeper front spoiler, larger air intakes, contoured rocker panels, and a unique rear lower valance. Like most drop-tops, the convertibles look better top-down. Both offer 13.8 cubic feet of trunk space, marginally better than the Audi, Mercedes-Benz and Acura rivals. Tossable, light and nimble, the 2018 BMW 2 Series is a true enthusiast's car, the modern-day equivalent of great BMWs like the 2002ti and 320i. Regardless of the numeral on the trunklid, the 2 Series is guaranteed to put a smile on the face of whoever gets behind the wheel. Both the 230i and M240i possess abundant power, exceptional suspension tuning and a manual gearbox that is sure to please anyone even remotely fond of rowing their own gears. Those with deep pockets can get even more thrills from the 365-horsepower M2. The 2 Series' small dimensions make it easy to live with in crowded city confines, and despite its enthusiast nature, the littlest BMW returns surprisingly good fuel economy. The EPA rates the 230i with an automatic transmission at 35-mpg highway, but during our time with the car we managed to see nearly 38 mpg. The Manufacturer's Suggested Retail Price (MSRP) for the 2018 BMW 230i starts reasonably, right around $36,000 including the $995 destination charge. The 2018 BMW M240i Coupe starts around $46,500. AWD on either model costs an extra $2,000. Order all the options, and you'll wind up with a 230i and M240i costing about $50,000 and $55,000, respectively. Convertible models add about $5,500 to the price of a 230i coupe, or about $4,600 to the price of an M240i. The Audi A3 and Mercedes-Benz CLA start a grand or two lower. The less refined Acura ILX starts even lower, around $29,000, but you lose performance and cachet in the bargain. Check out Kelley Blue Book's Fair Purchase Price Tool before heading to the dealership. We expect the 2018 BMW 2 Series coupe to retain slightly above-average residual values, better than the Acura ILX, on par with the Audi A3 and Mercedes-Benz CLA. The base-model 2018 BMW 230i coupe and convertible come standard with 8-way manually adjustable front seats, sport front seats, a 60/40-split rear seat, a 10-speaker audio system with a 6.5-inch display and HD Radio, keyless push-button start, a tilt/telescopic steering wheel, rain-sensing windshield wipers and 17-inch wheels with all-season tires. The standard powertrain is a spectacular 248-horsepower 2.0-liter 4-cylinder backed by an 8-speed automatic with paddle shifters, auto start/stop and rear-wheel drive. The 4-year/50,000-mile warranty is also standard, as is BMW Ultimate Care, which includes free scheduled maintenance for three years or 36,000 miles. All-wheel drive is available on all models, as well as a Track Handling Package. The Handling package lowers the car by 10 mm, includes Adaptive M suspension with Comfort and Sport settings, variable sport steering, larger M Sport brakes and high-performance tires. At $2,300 for the 230i coupe without the M Sport packages it's a very good deal. Other options include a highly recommended Driver Assistance package that bundles together a rearview camera with active guidelines and front and rear parking sensors, and a Cold Weather Package that includes heated front seats and a heated steering wheel. The turbocharged 2.0-liter engine in the 230i is one of the most powerful and refined engines of its kind on the planet. Generating 248 horsepower and a zero-to-60-mph run in under six seconds, this engine is perfectly suited to the needs of today's driver, as is its 35-mpg highway fuel-economy rating. For city dwellers the thought of parallel parking can be stressful. Thankfully, the 2 Series can be ordered with BMW's Parking Assistant that does all the hard work, leaving the driver to operate the gear selector, brake and gas. The 2018 BMW 230i gets a turbocharged 2.0-liter 4-cylinder engine putting out 248 horsepower, and routing it to the rear or all four wheels (RWD, AWD) through either a 6-speed manual or an 8-speed automatic transmission. The M240i uses a 3.0-liter turbocharged inline-6, boasting 335 horsepower and also available with the same drivetrain options. To help improve fuel economy in the city, all 230i models include an auto-stop/start function that shuts off the engine at complete stops. And its 248 horsepower gives it the title of the most powerful base model in its class. In fact, its excellent performance will make you question whether the 80 extra horsepower you get in the M240i is worth the money. The 2018 BMW 2 Series hearkens back to a time when BMWs were small, sporty cars that didn't cost an arm and a leg. Unlike those early cars, however, the 2 Series is a thoroughly modern design loaded with BMW's best technology and performance features. In contrast to front-drive competitors like the Audi A3 and Mercedes-Benz CLA, the 2 Series routes power to its rear wheels, although both the 230i and M240i do offer the option of all-wheel drive. Power for the 230i comes from a brilliant turbocharged 4-cylinder engine good for 248 horsepower; the M240i exceeds expectations with a 335-horsepower turbocharged inline-6. We only wish the slick 6-speed manual available on the rear-drive cars was also available on all-wheel-drive models. 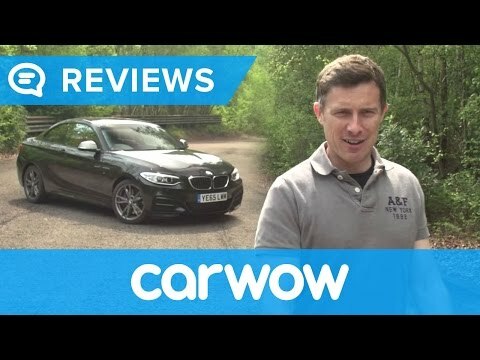 BMW M240 Review--THE BEST BMW YOU CAN BUY!! My car is probably part of who I am as a person. My vehicle is probably one of the best cars I have ever driven. Its reliable, very comfortable, a little pricey, but It's an amazing brand. It features comfort, productivity and a great engine. . The sounds are dominant, loud and nice to listen to. The radio is pretty good to. Easy to hook up car Chargers and other small things. This car should be on a top ten list of the cars to get in 2018, along with a Bentley car series. Beautiful car with one problem. The only problem I really have with this car is that it is really low to the ground. The bottom of the car is going to get scratched up no matter how hard you try to be safe with it. Speed bumps and going up/down driveways are always going to be a hassle. This makes it stressful when you are trying to enter a busy road with cars behind you. The sleekness and good looking aspect! This car is fun to drive, roomy! I rarely drive it, my husband does the majority of the driving. We live in NYC so I mainly walk, you we, subway, bus to get around! The car is comfortable and very good looking, it has been reliable although we've only had it 5 months. The storage is pretty good and you can fit 3 people in backseat pretty comfortably.